Beeline L02H / Beeline L02Hi. Network Unlock Code. How to unlock Beeline L02H by code? Unlocking Beeline L02H or Beeline L02Hi by code is very easy, it is also safest and non-invasive method of unlocking your device. To get code for unlock Beeline L02H you need to provide IMEI number of your Beeline L02H. Enter the web-interface of your Beeline L02H to check IMEI number, also IMEI is written on the information label under battery (it´s a 15 digit number). 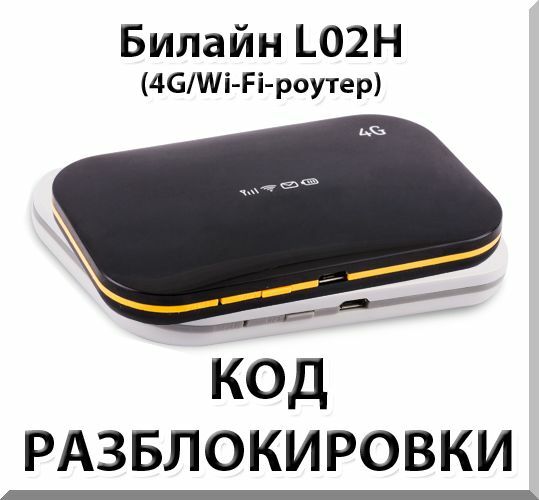 This code will only work with Beeline L02H, it won´t work with other devices. Insert a non accepted simcard in your device and power on. Enter web-interface. When the device prompts for the unlock code simply enter the unlock code provided to you. Your device is now permanently unlocked! Before you buy Unlock Code, power on the device with a non accepted SIM card inserted and make sure the device prompts for a SIM network unlock PIN (Network Unlock Code). If your device don´t asks for unlock code (i.e. remaining attempts left) - you shouldn´t buy this code!